You may, or may not, know this about me, but I was a vegetarian from the age of 10 until about the age of 25 (I can't remember the exact age, but I started incorporating a little fish into my diet around this time). I also love to cook and create beautiful food. So, when a friend of mine asked me to cater a party for her vegan, vegetarian, and pescetarian (fish-eating) friends...I was prepared. Served with Mache tossed with Lemon Juice, Toasted Hazelnut Oil, and Chopped Pistachios. Bring a large pot of water to a boil and add 1T. salt to water. Add beet slices and boil for about 1 minute, until tender. Remove from water and strain. Toss blanched beets with lemon juice, oil, and 1/4 tsp. salt. Marinate for at least 2 hours and up to overnight (the longer the better, to get all that good flavor). *I used a mandoline and sliced using the lowest setting possible, while still keeping the beet slices intact. I decided to blanche the beets, rather than leave them raw and think it's way better in flavor (more neutral and less earthy) and texture (tender and pasta-like, versus crisp in it's raw form). The recipe calls for 1T. Nutritional Yeast (adds a nutty, cheesy flavor), which I have omitted. Add all ingredients to a food processor and puree until smooth and fluffy, the texture of ricotta cheese. You'll need to add water, a little bit at a time, to get to this consistency. This will take a few minutes of pulsing and scraping. Test the flavor as you go and add more lemon juice and/or salt, if needed. Add all ingredients to a blender or food processor and puree until smooth. I strain mine through a sieve, so that it's super smooth, but you can leave it as is. 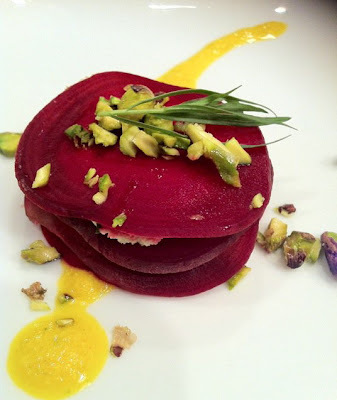 Arrange beet slices (the number of raviolis that you would like to create) on the plate. Place a dollop of "cheese" on top of each beet slice, top with a drop of pepper puree, and top with another beet slice. Continue this process 1+ times, until they are a height you'd like (I used four slices per ravioli); the last beet slice will not be topped with "cheese". Garnish the top of the ravioli with chopped pistachios and a tarragon leaf. You can also sprinkle the plate with pistachios for added color and texture. You can also make this recipe using butternut squash, which will create larger "pasta" and can try roasting the bell peppers for a more rich-tasting sauce. The nice thing about this recipe, besides it being so good, is that it's super easy to assemble (once the prep is done) and can sit out without any worry of it getting cold. It's a great first course that is sure to impress dinner guests. I had some vegan cashew cheese in St. Louis, made by a friend. I have not figured out if it was soaked and fermented, or just soaked and then had lemon juice added. This is a pretty standard recipe for "Cheese", with the addition of nutritional yeast (to give it the cheesiness). I like this as a dip, as well. You can also add any herbs you like. Cashews give the "cheese" a little more creamy texture, while macadamia nuts seem to fluff up more, like ricotta. Pretty cool! Thanks for the "ricotta cheese" recipe! I miss dairy so I was excited to find this!! I am baking an eggplant casserole right now with the "ricotta." Hopefully it will taste GREAT! If you're not on FB, let me know how it tastes!